Italy’s most famous road race, the Mille Miglia, is a thousand miles. (It’s in the name and everything.) 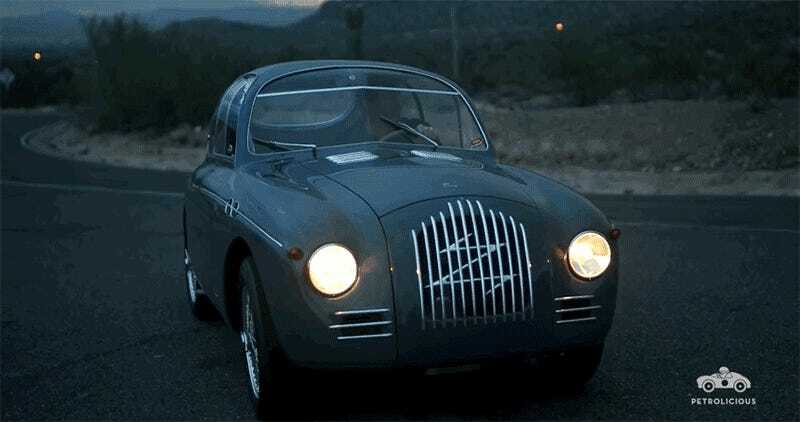 This unique 1949 Fiat Topolino 750MM Zagato packs 13 air-cooled horsepower, but it went for it anyway. If you’re into cars and design in general, you might recognize what makes a Pininfarina or Bertone. Hell, you probably even know what Ghias are supposed to look like, or how to spot Giugiaro’s touch. Zagato is different. You simply can’t mistake a Zagato for anything else out there. And it’s not because of all the ‘Z’s over their cars. As they say, the devil is in the details. Milan’s most famous coachbuilder only made eight 750MMs based on Fiat’s pre-500 workhorse, the Topolino. Of those few, only one is known to have survived the last almost seven decades, and Scott Gauthier, owner of the G Collection just extended its life indefinitely. Petrolicious went for a drive. In 1949, 13 horsepower in a compact family car. In 2016, 350 horsepower in a compact family car.